Surgical gowns and drapes are critical pieces of equipment in hospitals. They need to provide the medical staff and patients with a high level of protection against bacterial and viral infections. Surgical gowns and drapes are critical pieces of equipment in hospitals. They need to provide the medical staff and patients with a high level of protection against bacterial and viral infections. Research shows that 1 in 10 hospitalized patients will acquire an infection after admission. That is why infection control is a key topic. 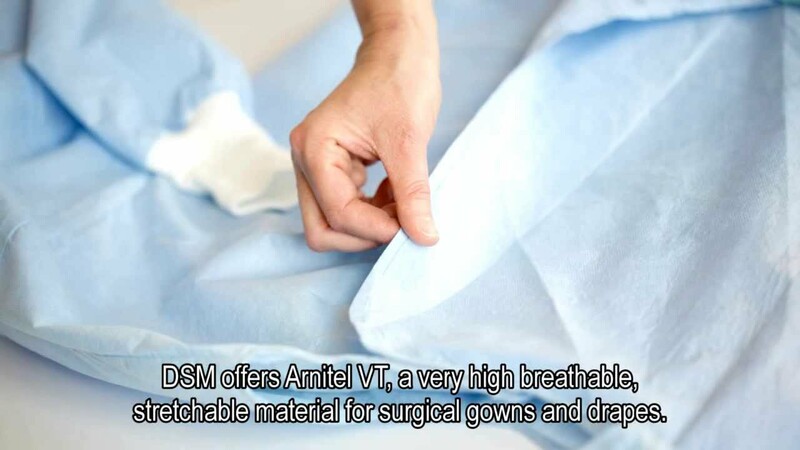 Arnitel® VT is a very flexible and breathable material that, when made into membranes just a few microns thick, is 100% waterproof, highly breathable and very comfortable. Arnitel VT based membranes are not reliant on tiny perforations, but due to its unique material design it is breathable and comfortable but is a 100% barrier against fluids, bacteria and even viruses. Gowns manufactured with the Arnitel VT technology finally provide the surgeon with 100% protection against viruses and bacteria without loss of comfort. With this unique combination Arnitel VT supports DSM’s mission to develop advanced materials that make people’s lives healthier and safer.